Power BI is a cloud-based business analytics service that gives you a single view of your most critical business data. data on the go with native Power BI Mobile apps. It’s easy, fast, and free. Power BI is a suite of business analytic tools that deliver insights throughout an organisation. A user can connect hundreds of data sources, simplify data preparation and drive ad-hoc analysis. Companies can also produce reports that can be published across the organisation on the web and on mobile devices. Everyone can also create their personalised dashboards with unique 360-degree view of their business. As a cloud-based business analytics service, it gives you a single view of your most critical business data. Monitor the health of your business using a live dashboard, create rich interactive reports with Power BI Desktop and access your data on the go with native Power BI Mobile apps. It’s easy, fast, and free. If you are using Microsoft Dynamics 365 or any other business management solution, we will be able to show you how this business intelligence tool works seamlessly with your solution of choice. Pre-built connectors allows this solution to easily integrate with your favourite business apps, and to immediately start benefiting from the analysis you can obtain. Power BI gathers all your on-premises and cloud information in one central location that you can access whenever and wherever you want. 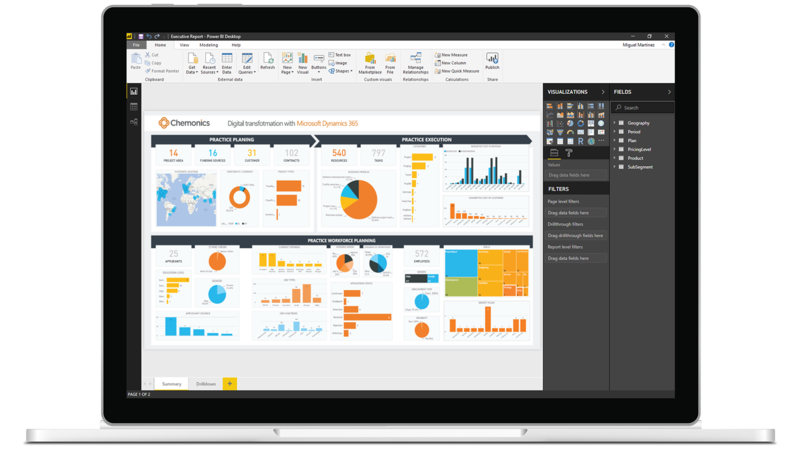 Power BI makes you a master storyteller with stunning visualisations and interactive dashboards that offer a consolidated live view of your business. Monitor all your critical business data from one dashboard from any of your devices or on your desktop. Visually analyse your data and share reports in seconds using Power BI on the web. Create robust data analysis models for consistency across your organisation. Integrate existing apps and solutions with Power BI to create visuals in Power BI. Get started with Power BI. Visually explore your data with a freeform drag-and-drop canvas, modern data visualisation and simple report authoring.